Tears welled up in her eyes. She missed those days of her life. A break taken to raise her granddaughter was something that was her decision and she had no complaints about it absolutely. Though running after a toddler and enticing her to eat her meal, singing songs, reading a book for her and being her playmate, left her tired at end of the day, the unadulterated love that was bestowed upon her by little Angel scored far above. She did not want her daughter to quit her job when she was so well qualified, doing very well in her career and had aspirations. Nor did she have the heart to leave the little one in a day care or with a nanny. She had nothing against them but she believed that the love and care that is showered upon a child by family cannot be be superseded. These initial years is when the child yearns for this and once years pass and he grows up, he probably wouldn't even care. Somewhere no longer getting that monthly credit in her bank account, however big or small the amount, made her feel insecure. Though her daughter never refused her anything, in fact coaxed her to buy stuff- the feeling of spending your own money is always different. I am elated that she has found her calling- her desire to work as well as be a part of the baby's growing years. She decided to start a day care center in her complex, to leverage her rich experience in this line, at the same time it would be a good practice for her little granddaughter who is 2 now- to spend time with other kids and she would find it much easier when she had to start schooling. I am happy that she found a way out rather than whining about it and getting miserable and I know she will succeed in her venture- for I have always known her to be a lady of steel- firm resolve and committed. Ah yes for those who have been reading my posts regularly would have known by now it’s my Mom whom I am talking about. 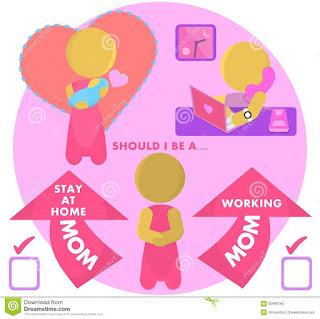 We all have these days don’t we- as a working Mom as much as I love my career, at times I am so angry or upset over things that may not go my way that I find myself thinking- is this my true calling? What if I quit this job and stay at home pursuing a different career- focus more on my blog, maybe write a book, take up salsa classes something I always wanted to do and the best thing would be spend more time with my daughter Angel. The reality bell rings- I mean my skype call and I am back to my real world. Yes despite these moments of low, I know this is what I do out of choice and this is what empowers me. The purpose of sharing this is to just reflect upon the phase of transition which I am sure is seldom easy. I was speaking to a very close friend on New Year to wish her. We both studied together in college and also took up CA together but unfortunately she couldn't clear it and decided to start working. She is a dedicated, sincere and level headed girl who took pride in working. She was always serious about her career and whenever we spoke, this was something we always discussed. She got married and moved to Cochin where she worked in a US Shift which meant she came home in the early hours of morning. It was not an issue with her in laws as her hubby too worked in the same office, in fact that is where they met, cupid struck and they tied the knot. However things changed when she became pregnant, it was a high risk pregnancy and the child was born pre maturely. She had to quit her job and has been on a break ever since. Her son is 3 now and is going to play school. While I have no regrets she tell me as I enjoyed every insane moment of Keshu's childhood which would not have been possible had I gone back to work- but somewhere I miss working. I miss dressing up, going to office, talking to colleagues, the number game and cracking those accounting breaks that I always loved. At times just like everyone I have my bad days, a tiff with my hubby, my MIL and me arguing over something, the child giving me a hard time and I know these were and will always be a part of life but earlier however sullen my mood was- once I stepped into the office, I would somehow forget it and get engrossed with work, chatting with colleagues over chai and when I stepped out of the office, somewhere that moment had passed and I felt lighter. While now, it’s no longer the case. I don’t have a single friend whom I can talk with, some of them are busy with their jobs, and others are busy with their babies. I wish like our other college friends I had never worked, I would not have known that world in that case I would never have missed it, for you cannot miss something you never knew right? I felt guilty for being so immersed in my job and baby that I hardly called her, I resolved to talk more often. I know she has been looking for a job for quite some time now but in a small city like Cochin and for a mom who has taken a break for 3 years it is not easy. I also thought about the lonely part she mentioned and saw a similar trend as my Mom’s story. I am not very social and it’s not that I have a bunch of friends I hang out with every other night, but the thing is going to work, talking to people- may not be about things in your heart but even a casual chat about a movie, the new restaurant or office gossip in general gives a feel good feeling. I could also relate to her point of going to work with a bad mood due to something that happened at home, being forced to put this stuff on your mind aside for a few hours as you need to focus on the job at hand and when you end the day, you feel much relaxed- I have experienced the same on many occasions. This post is not at all about urging SAHM's to get back to work- NO- It’s a personal decision at end of the day coupled by circumstances. And I would leave it to the individual in question. I just wanted to highlight the struggles and little victories of some of my near ones who have seen this transition. It’s not easy but as they say every cloud has a silver lining, you just need to find yours. Do share your story, how was the initial period post the big decision? How is it now? Do you plan to resume work or start an alternate career? Happy to hear your thoughts in the comments section. Mine was easy as my husband changed his job and we moved back to our hometown as I conceived as I required a support system during those days. Had a bit of s tough pregnancy initially. However my mom in law was working in a bank and had only few years left for retirement so I decided not to start and take a break for the first five years. Then again my husband changed job so we moved to Mumbai. Here it became difficult for me to find a job as I had taken a long break. 2 years just passed away like that doing nothing worthwhile as now my daughter too had adjusted to her routine. And since I had always been working since I finished college I started feeling incompetent. Then blogging gave me a perspective, I am enjoying what I am doing now. Then this opportunity to work for children's newspaper 'My Paper' came along and now I am sub editor with them . Plan to start my own parenting website this year. Hopefully all falls in place. Special mention to mommy bloggers like you Akshata who read my blogs and encourage me. Thanks for sharing your story Aesha, it is indeed a remarkable journey -happy to see you grow and my best wishes as a friend are always with you. Want aware of your new venture, great to hear it. Good luck and would be happy to be associated with it! Thanks Neha for sharing your story. The truth is I would never know what it feels like as I never took a break but from the stories of women I know, I thought this is worth sharing. And so happy to hear your story that you found your true calling. Good luck with the ventire, I am sure you will rock it! !